Cushioned paneling and flatlock seams combine in the ASICS Mid Height Running Sock to deliver superb impact absorption and shock attenuation in any item of footwear. 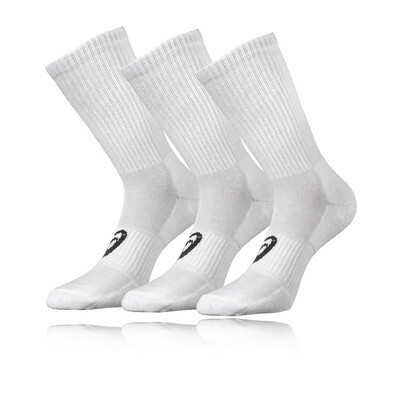 "Nice for a long distance run"
Excess moisture is wicked away from the skin to promote a dry, cool and altogether more pleasant environment, whilst cushioned paneling implemented throughout the sole enables the sock to provide ample cushioning and shock attenuation in any item of footwear. Lastly Flatlock seams have been used throughout to reduce chafing and consequential blistering, allowing you to perform at your peak level without any distractions. Moisture Management - Excess moisture is wicked away from the skin to promote a dry, cool and altogether more pleasant environment. Cushioned Panelling - Enables the sock to provide ample cushioning and shock attenuation in any item of footwear. Flatlock Seams - Reduce chafing, irritation and consequential blistering.